Rainforests have a mystical quality about them. It’s dark in there because little light shines through to the ground. The trees are so tall, with leaves reaching out to create a natural roof over your head. The climate is tricky if you’re not used to it; extreme humidity and high temperatures will affect everyone who isn’t used to that climate. But there, amongst the trees and plants and ground, live some of the most wonderful animals and vegetation on our planet. More than half of the 10 million species of animals, plants and insects live in rainforests. It’s a diverse, immersive topic to explore, teaching so much about the natural world around us, deforestation and what we can do to protect our precious environment. We’ve created some ideas and instructions for rainforest animal crafts so kids can bring this mystical part of the world into their life. You’ll also find some child-friendly rainforest facts to discuss with them at the end of the page. Have fun, and don’t forget to share your craft results with us through any of our social media channels. Just add #toucanBox! There are many ways you can create a stunning and lifelike rainforest art. We went on a little nature hunt and picked up some natural materials from outside. When we got back, we just rummaged through the art drawer for a few basic items. 1 Spread out your nature-walk haul onto the table. Have a sort-through, and pick out your favourite items. 2 Have a look at some rainforest pictures online to get some inspiration. Decide what you’re going to try and recreate. 3 Assemble the material on your paper how you would like it to look in the end. You may have to cut leaves in half, reduce its length, fold items, twist items around or do a mix of everything! Make sure that each piece has enough contact with the paper or underlying piece so that it can get stuck on. 4 It’s good if you take a quick image of your creation so that you can rebuild it and don’t have to start from scratch if you start to stick the pieces on the paper with glue. 5 As you remove the items from the paper, try to remember the order that you do it. When you stick them on, you’ll be placing them back in reverse. 6 Begin to stick down your items. Add glue or tape to wherever the materials touch the paper. Add your materials one by one until you’ve recreated your work! We love salt dough activities! Keep your eyes peeled for an upcoming post about our in-house salt dough sessions. It doesn’t matter how small or big your child is (here at toucanHQ we’re very big kids), salt dough allows complete open-ended creativity to create 3D sculptures. It’s easily manipulated and stuck together, and hardens to create a long-lasting work of art. Once it’s dry it can be painted or decorated! Here are just a few rainforest-inspired ideas of what you can do with salt dough. Roll some salt dough into a sausage shape, add a ball-head and a slithery forked tongue. Sssspectacular! This one’s a little more complicated, but is great for experimenting with little extra bits of detail, like nostrils, spikes and claws. Well we had to, didn’t we. You could even use some leftover materials from your nature walk to create a mixed media work of art! 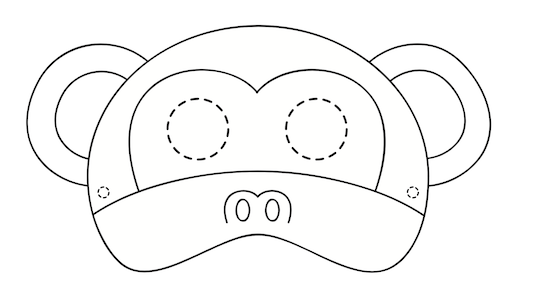 1 Print out your mask. You might want to print it directly onto cardboard, or cut it out and stick it to some spare card (an old cereal box will do). 2 Colour in your mask. 3 Make two small holes either side of your mask. Tie a short piece of elastic so you can wear your mask. 4 Practice your best monkey moves! Snakes loves rainforests. It’s the high trees, the easy-to-camouflage-in rainforest floor, and the rodents and bugs that are just waiting to be gobbled up for lunch. 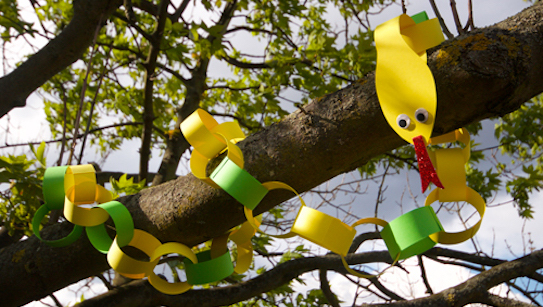 If you’ve got some coloured cardboard to hand you could make this exotic, winding snake. 1 Cut out strips of card, about 5cm wide. It’s easier for little hands if you cut horizontally across an A4-sized piece of card. 2 Add glue or tape to one edge of one strip of card. Bring both edges together to make a loop and stick it together. 3 Place another strip of card through the loop. Add glue to the edge of the card, and make a second loop so the two pieces of cardboard are linked. 4 Keep doing this! It doesn’t matter how many loops you make. The more, the better. 5 Draw a snake head onto a piece of card. Cut it out and stick it to one end of your loop chain. Add eyes and a forked tongue! 6 Find somewhere fun to put your rainforest snake! You’ll find about 3,000 editable fruits in amongst the rainforest. Plus a fair few that would not be so kind to your tummy. Scientists anticipate that there are still millions of insects yet to be discovered. Only 6% of the earth’s land is rainforest, even though half of the planets plants and animals live there. Rainforests get on average between 250cm-450cm of rainfall a year. That causes a splash. A sloth only comes down from its tree once every seven days. It’s to have a poo. The Amazon rainforest is the largest rainforest in the world. If it was a country it would be the 9th largest country in the world! Rainforest is an official, ecological term. A jungle usually is a description of an area of land that’s overgrown and hard to get through - think of having to chop through vines and plants to find your way. In this sense, most jungles exist in rainforests. Sadly, rainforests are under threat from deforestation (the loss of trees and plants). There are little things that you can do to help. Ask your parents to shop smart! Check that rainforest-grown food - like bananas, coffee and chocolate - is grown in a sustainable way. Look out for the Rainforest Alliance’s little green frog symbol to show it has been grown in a way that’s safe for the environment. Try to use less paper and re-use paper instead of throwing it in the bin. Cut it up to use as note paper, or recycle the paper you use. Talk to your parents and teacher about how they recycle their paper.